How to create a new robot or object? How to create a new solver? The running_taskname_coordination.lua and running_taskname_fsm.lua, are sub-FSM's of the running state of the task (defined in taskname_fsm.lua). They are executed sequentially, first the coordination part, then the FSM part. 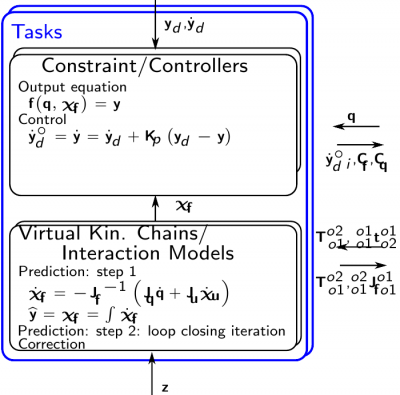 A tasks consists of a Virtual Kinematic Chain (VKC) (except for constraints on joints only) and a Constraint Controller (CC). A VKC inherits from VirtualKinematicChain.hpp in the itasc_core unary stack, which serves as a basic template. joint_motion: This task has no virtual kinematic chain, because its output equation is y=q. It constrains only the joint coordinates.